Well, I’ll admit that our site has been pretty quiet over the last month. Exactly one month ago today, we welcomed a new addition to our family – Seth Hudson Sancheti! We’ve spent the last month getting to know him and getting adjusted to the routine of “baby” once again. What a blessing! Today, I’m feeling back up to blogging again and wanted to make all of you aware of something great I found for our oldest son, Shaan, who is 4 and a half. Recently, Shaan has been into reading a pretty good bit. We’ve been using a lot of Margaret Hillert books, Rookie Readers, and “I Can Read” books. 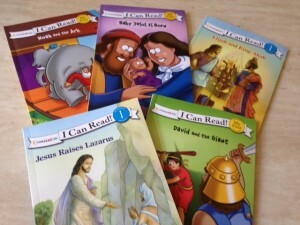 I was so excited to find “I Can Read” Bible stories on Amazon the other day. We went ahead and ordered 5 of them (“My First Shared” and “Level 1″ readers) and Shaan has really enjoyed them. 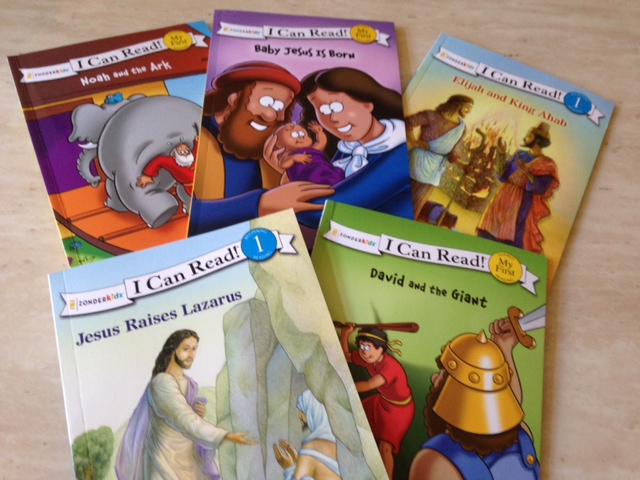 I love them because these books allow Shaan to be in control of reading the Bible stories (as opposed to always “listening” to the stories). He loves to “teach” (play/pretend), so he seems to really enjoy “teaching” us the stories. It’s just another way to engage him in the stories from the Bible and incorporate God into the “everything” (i.e. in this case “reading”) of his world. Look them up on Amazon – I highly recommend them! More blog posts coming soon – I’ve got lots to write about – just trying to find the time to squeeze it in with the new baby! Stay tuned!